Blogging and writing for NAILS Magazine has become an important part of my career. Writing was a passion I had in school that seemed too much like an unrealistic dream. Funny how most people would look at nails as a “non-job” and I do nails because I didn’t think writing could be a real job! Sometimes life’s ironies are a rollercoaster of entertainment. To my surprise and delight, I was asked to take on additional occasional writing for another blog, along with several other people like Sarah Waite of Chalkboard Nails. This blog is on the CND channel, however it’s targeted to all nail professionals no matter what products you use. 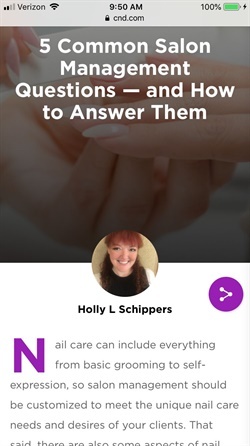 My first piece covers five salon management questions that any nail professional should be able to answer for clients. You could also share it through your own social media to encourage future clients to ask these questions when choosing a salon! The blog is brand new and just kicking off — I would love to know your thoughts on the debut pieces. You can find the full channel at cnd.com/blog. Please leave your thoughts, feedback, and ideas in the comments below!